These are a few of many "color keys" I did for Shrek the Halls. Their purpose is to establish the mood and lighting of each location in the show. Happy Thanksgiving from me and the "Shrek the Halls" crew. 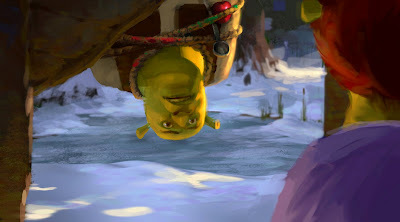 Shrek the Halls is a half hour TV special about Shrek's first Christmas with his family. 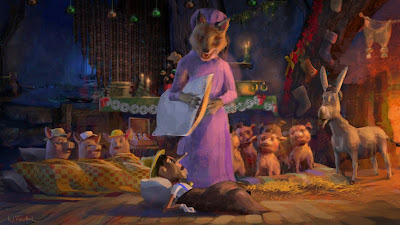 It's an absolute gem and I think people will watch it with their kids year after year just like the Grinch or Charlie Brown's Christmas. It will be on the abc network on Nov. 28 and again on Dec. 11. Check your listings for local times. We developed the show here in Glendale and I followed it through production at our Bay area campus in Redwood city. 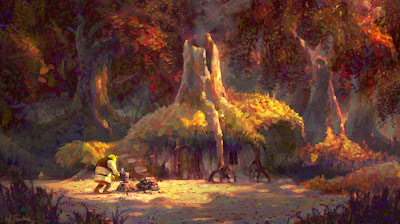 Here's an image of Shrek out chopping wood as the seasons change and head toward the Holidays. 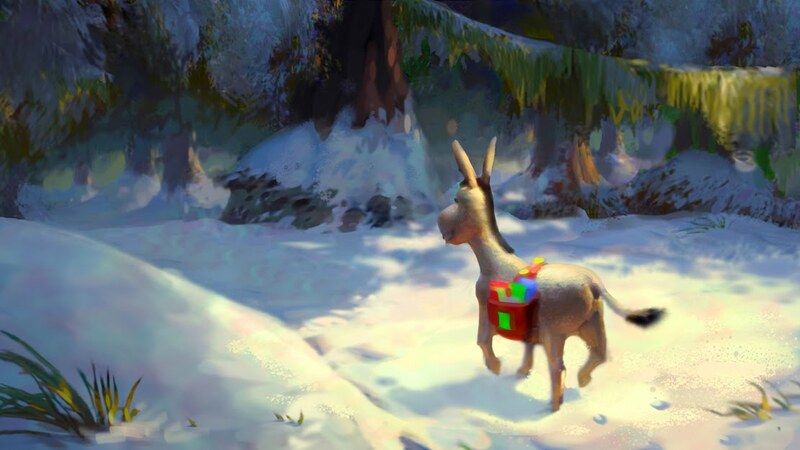 It's painted in photoshop. 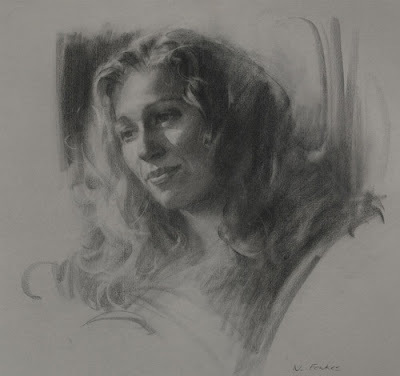 The image is copyrighted by DreamWorks animation SKG.
. Mark, demonstration with charcoal. A note about the process here. I show these elaborate line drawings that end up getting completely covered over by the tonal work. This is done intentionally as an exercise for students. Invariably, beginners carefully render parts of the anatomy but are far less careful about relating those parts to each other. (You've seen those drawings that look like a bumpy sack of walnuts.) In class we start with careful construction drawings that force students to properly fit each part of the anatomy into the whole head. 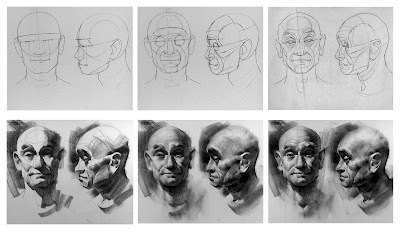 Having done plenty of the bumpy, poorly constructed heads myself, I forced myself to use this method and got much improved results. That being said, for my current tonal drawings I do the line drawing quickly and lightly. Not nearly as refined as you see here but with the idea in mind. I hope these drawings make clear how the construction lines can help wrap the light and shadow around the whole head for a solid three dimensional effect. You can see more demos if you scroll down to August of 2006. 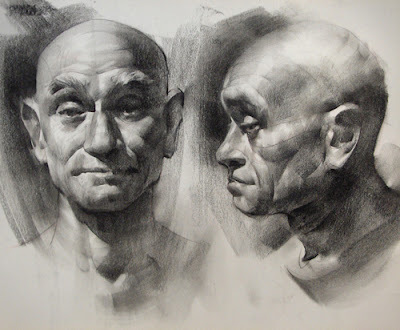 I've just started teaching my head drawing class so here's a new charcoal drawing for this week. I'll also be posting a few demos in upcoming weeks among other things.